Congratulations, Oak Bay High Class of 2015! Yesterday evening, I attended the graduation ceremony for the Oak Bay High School Class of 2015 – an impressive send-off for this year’s 258 seniors…my eldest son among them. This year’s grads will forever hold the distinction of being the last group to graduate from the school’s current (and decidedly historic) buildings, which date back to 1929 and 1953. For their final two years of high school, the Class of 2015 patiently endured the noisy distractions of construction as a new Oak Bay High took shape right next to the old one. The old buildings will be razed this summer; and when school resumes in September, returning students and staff will convene in shiny new facilities. Cheer up, Class of 2015. You may not get to enjoy the new classrooms and labs, but you’re the first graduating class in Victoria – possibly in all of Canada – EVER! – to get a great big Strava-doodle send-off. And that’s way cooler than a brand new school. 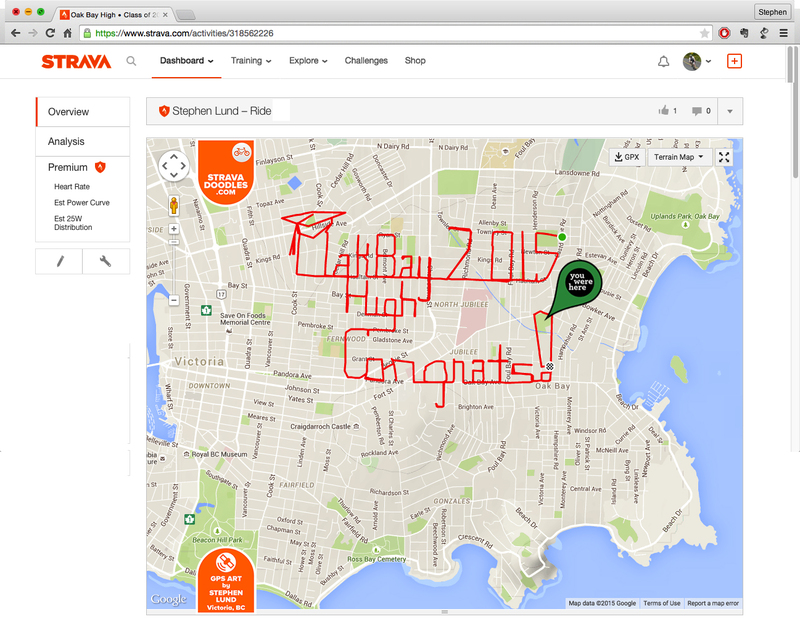 This entry was posted in bike-writing, gps art and tagged bicycling, Class of 2015, creativity, cycling, garmin, gps, gps art, graduation, Oak Bay High School, strava, strava art, victoria bc. Bookmark the permalink.